The chat bot, or bot (short for robot), is the thing these days. A bot is an artificial intelligence software program designed to imitate intelligent conversation. 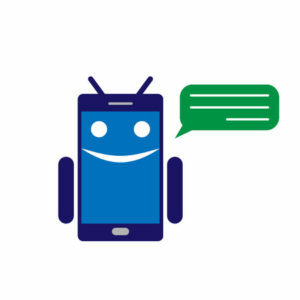 The bot interacts with the human user via text or voice. The interchange could be simple (user asking whether or not a company carries a particular product) or complicated (user asks bot how to solve a computer problem). What does this bot buzz mean to consumers? To businesses? While the chat bot has been around for awhile, it recently picked up speed for a number of reasons, not the least of which is its ease of use. Apps, on the other hand, require work. When three J.W.Morton employees were asked how many apps they use in one day, the average was seven. That’s a lot of work. They had to find the apps (not easy, unless you have the app’s name), download and learn them—times seven. A bot, on the other hand, can immediately personalize information because it has access to the user’s social media profile. And because, unlike apps, every bot has the same user interface, there is no learning curve. Whether you want to order sandwiches for delivery or find out if the nearest hardware store has your favorite wrench, the bot experience is almost seamless. As the world witnessed last spring, bot technology has not yet been perfected. Microsoft developed a bot, named Tay, to conduct research on conversational understanding by chatting up Twitter users ages 18-24. Tay was shut down just 24 hours after its launch. A handful of Twitter users were able to manipulate the bot so that it tweeted racist messages. While Microsoft has definitely made progress on bot tech, the “teaching moment” on Twitter taught them to return to the drawing board. An article on Bloomberg.com says the bot economy is growing faster than the app economy did in its early days. There are three times more bot developers in a six-month period than there were for apps in 14 months. The article predicts that bots will become everyday technology, just as apps have. Most of what is being written about bots focuses on their ability to take over repetitive customer service tasks. However, others propose that bots can have merit outside boring, routine tasks, if developers devote themselves to building bot technology in that direction. A recent AdWeek article offers a few thoughts on bots as they relate to marketing. What about a survey bot? Now that is definitely something for marketers to chew on. The potential for increasing a client’s conversion rates for branded content is enough to make an ad agency giddy. Can a bot replace me? OK, this last question is not from the article; it’s our own musing. It comes to mind because a subset debate within the big chat bot discussion is whether or not bots can replace public relations professionals. For instance, it’s conceivable that a chat bot could answer basic media questions regarding a client’s story and be programmed to refer specific “trigger questions” to us or to another source. As convenient as that would be, there will never be a replacement for gauging an audience’s emotional response to a client’s potential PR story or advertisement, or for creative problem-solving in response to real-world events. That’s up to us humans of the PR and marketing persuasion.